The Between Collection - Post&Co. There are more than two choices in life, there is a third, a fourth – there is ‘other than.’ Imagine an existence where alchemy is part of the ordinary, where elegant does not lead to extravagance but to a uniqueness and where heritage does not mean looking back but reflection with respect to living in the moment. Modest and unpretentious yet boldly individual, soft but not feminine, strong but not overpowering, this is where the between resides. 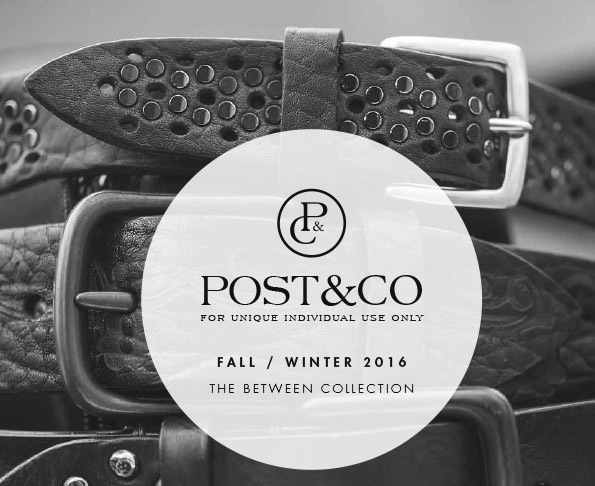 Post&Co has created a collection for the individual adhering to its core vision; our love for exotic and natural materials and the craftsmanship that pays respect to their beauty. Tradition and innovation work hand-in-hand with an understanding of what it is to live in the modern world. We bring to you a collection that is true to today yet timeless, creating a place suspended in reality and imagination.